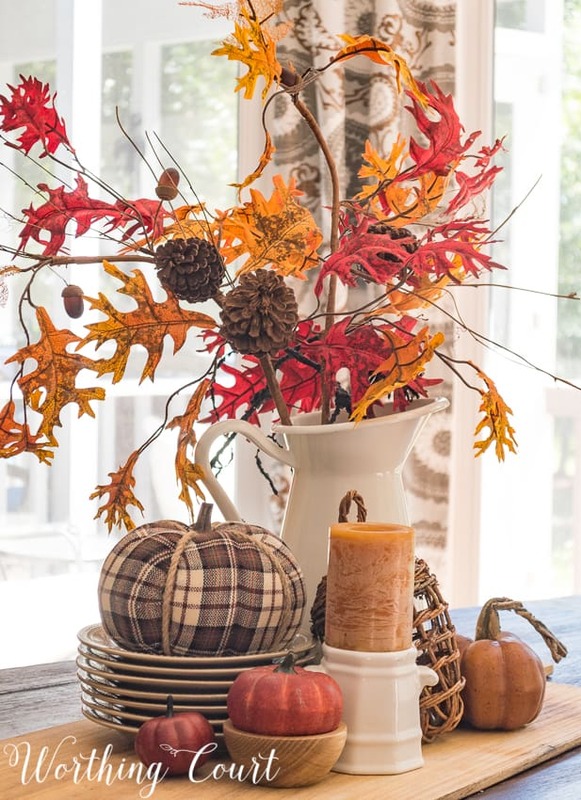 Eleven inspiring ways to decorate your table for fall or Thanksgiving with an easy diy centerpiece using pumpkins, fall foliage, acorns, pine cones, fall candles and more. Whether your taste in fall decor leans toward traditional fall colors or neutrals or something just a little unexpected, these centerpiece ideas will look lovely on your table from now all the way through your Thanksgiving feast. Bonus! Each one of these centerpieces can easily be copied and goes together in about ten minutes or less. How’s that for saving you time during this harried season of the year?!? Hit your favorite spot to stock up on pumpkins in a variety of sizes, shapes and colors and shop the outdoor areas around your home. 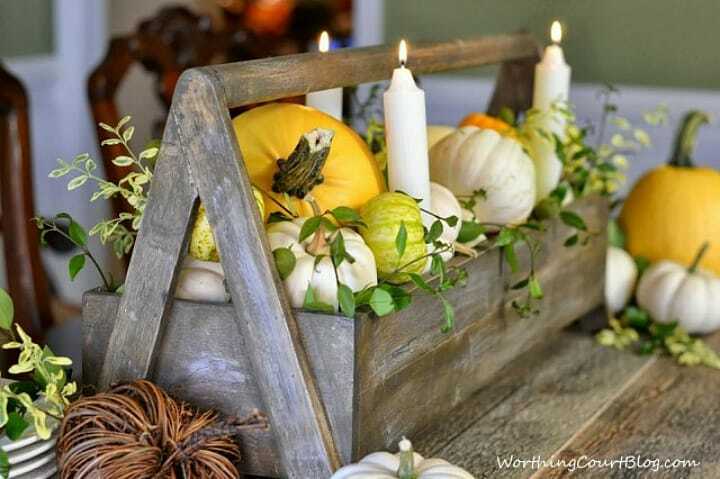 Artfully arrange the pumpkins in your box, add a few tapered candles (don’t ever leave them unattended when lit! ), then tuck fresh greenery into empty spots for the finishing touch. Here’s the same toolbox decorated with traditional fall colors. 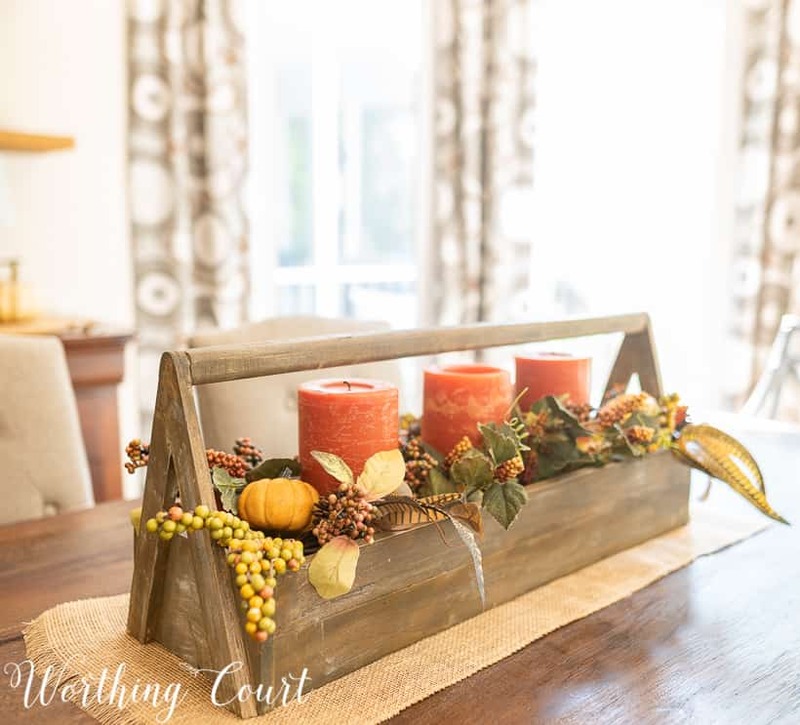 To create this look, place a piece of scrap wood in the bottom of the box (if you need to elevate the candles), add three candles in a row and fill in with fall picks. This literally took no more than five minutes to put together! 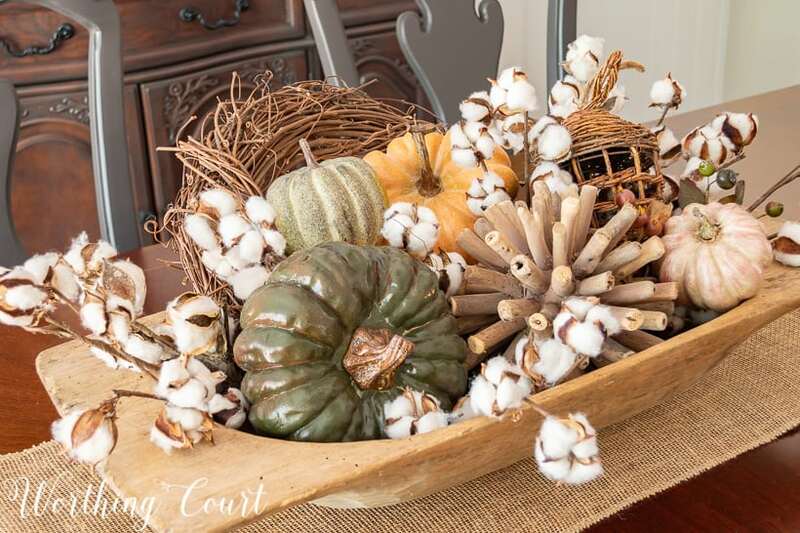 To create this bountiful centerpiece, “anchor” the centerpiece at one end with a tall container filled with foliage and feathers, add the candlesticks and candles, add a small round wicker tray and a few stacked plates, then add pumpkins turned this way and that and fill in the rest with all of your favorites. Another idea for giving a nod to a bountiful fall harvest is to fill a wooden dough bowl with pumpkins, twiggy orbs and a grapevine wreath. 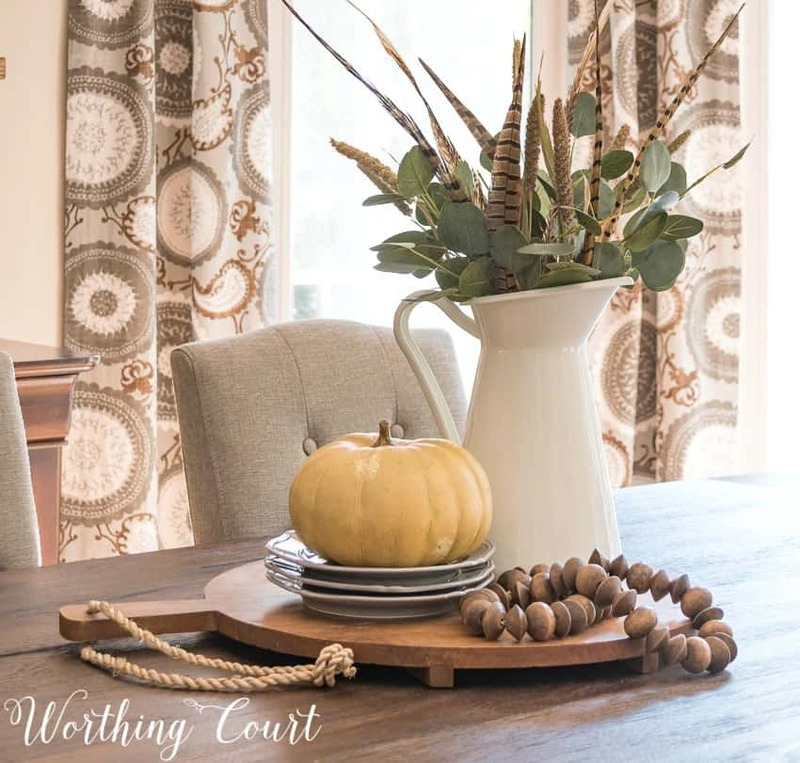 Add the grapevine wreath first (you can see it leaning against the back side of the bowl), add the larger elements like the pumpkins and spikey orb, wicker acorn, then finish the arrangement off by tucking a few stems of cotton into the empty spots. 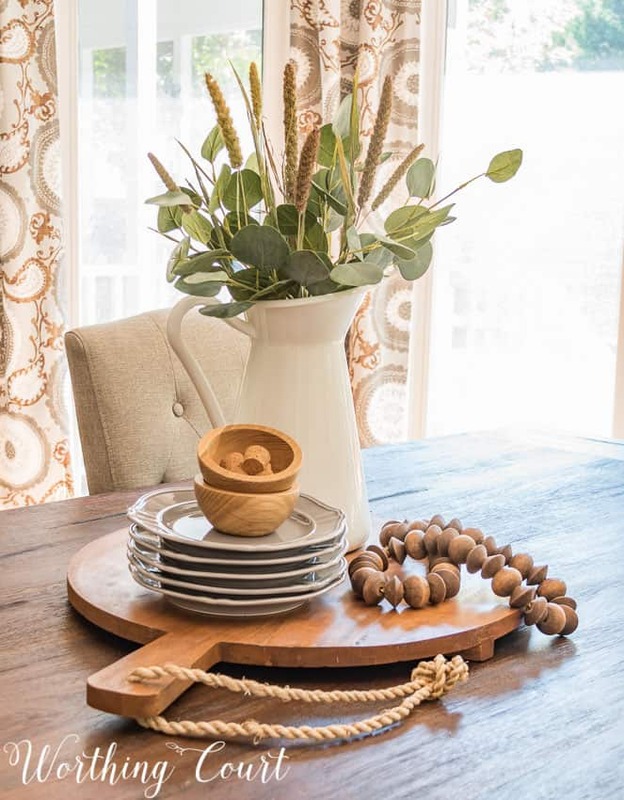 Placing the dough bowl on a runner or piece of burlap will help to ground the centerpiece on your table. 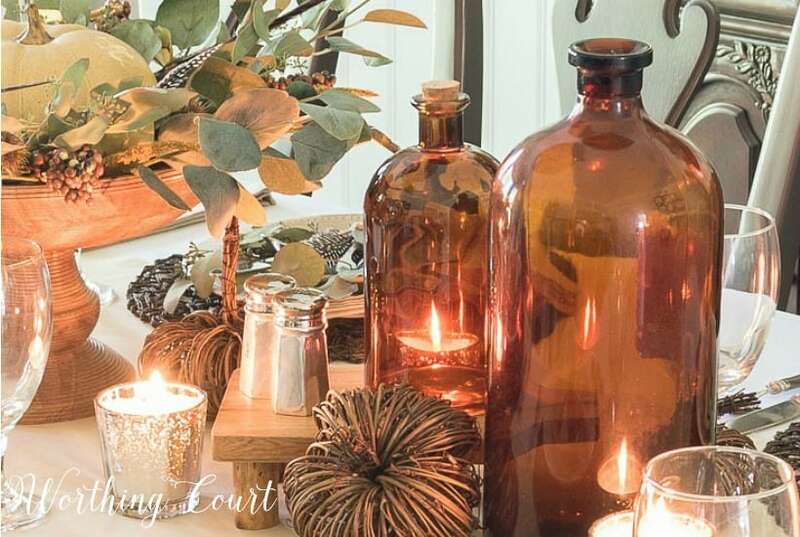 It also works well to create a centerpiece with a display of pumpkins and candles running down the center of your table, without using any container at all. 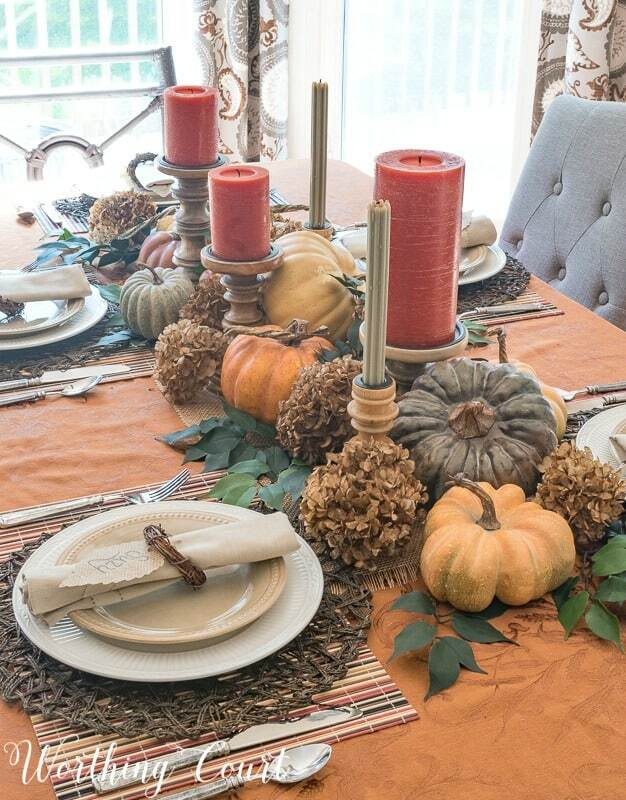 Put the candlesticks in place first (for this look, I like them staggered instead of lined up in a row), then place the pumpkins, turning and leaning them against each other. Lastly add dried hydrangeas and greenery to fill the empty spots. And nobody ever said that all your candles have to match! Yes, you can have a little glam for fall without being all stuffy formal! I’m more of a relaxed and casual kind of gal instead of strictly dressed-up or formal, so I like for the decor in my home to reflect my casual personality. Velvet pumpkins are deliciously yummy looking, but to bring down their formality, I paired them with rustic crinkle paper shreds and a few pip berries. Get my step-by-step directions for the cheater way to create this overflowing pumpkin container HERE. 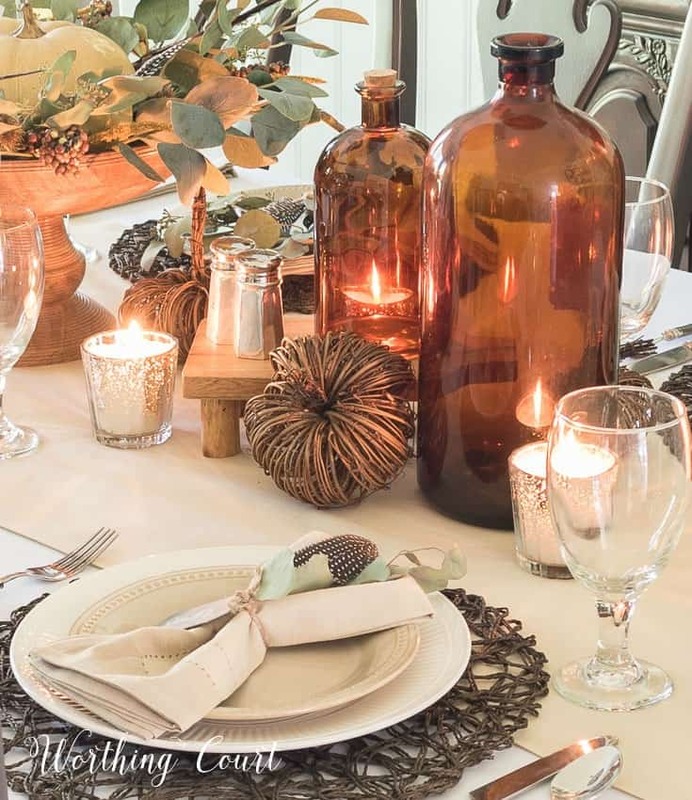 In this rustic/glam centerpiece, amber bottles, a wooden pedestal bowl and grapevine pumpkins have been paired with mercury glass votives, beautiful eucalyptus and linen napkins for a casually elegant table. To recreate this look, place the pedestal bowl, amber bottles and other large elements first. 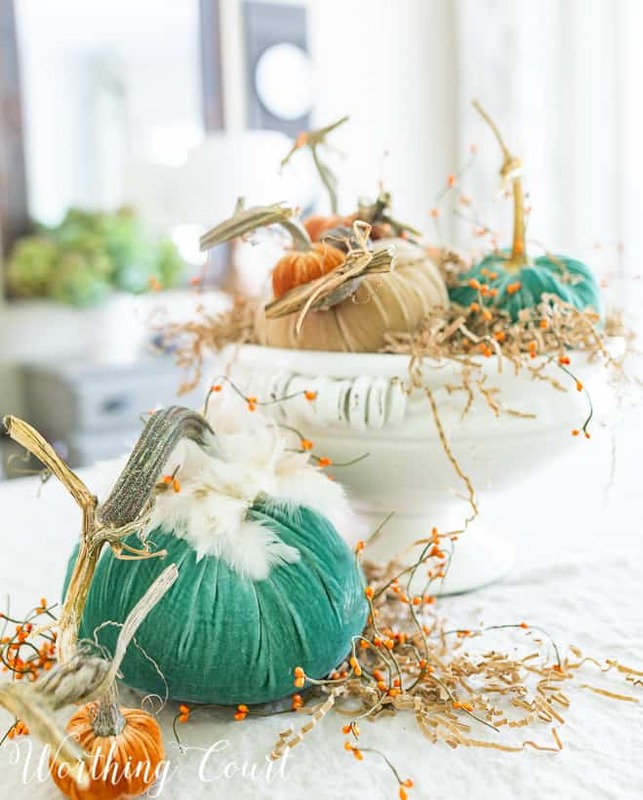 Fill the bowl with a large pumpkin with eucalyptus sprigs and berries tucked under the edges, then fill in the rest of the centerpiece with a variety of rustic and glam pieces. Here’s another example of a casually formal centerpiece. 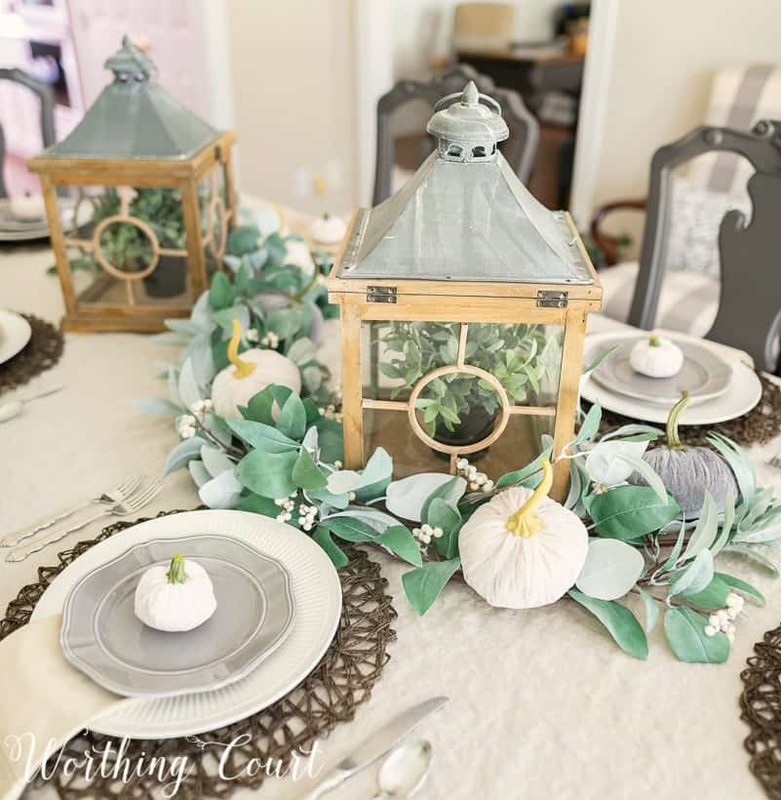 For this look, I simply put two rustic lanterns in place, then wound a eucalyptus garland around them in a S pattern and added a few white and gray velvet pumpkins running along the garland. I kept the theme going by placing a potted faux greenery plant inside each lantern instead of the candle that you might normally expect. One other tip – two garlands intertwined together will look much more lush than one garland on its own. 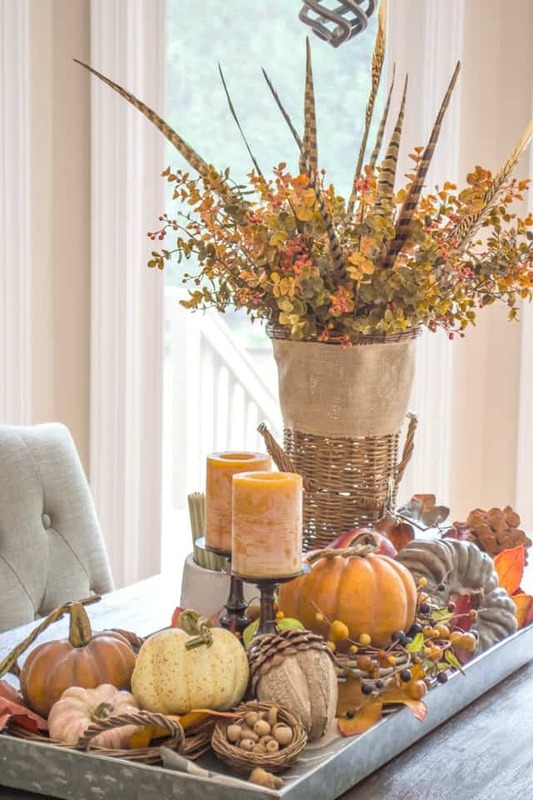 Bread boards make a great base for a fall centerpiece! Although I use them year round, the color and texture of the wood says ‘instant fall’ to me. For each of these looks, but the bread board in place, add the tall elements off to one side instead of right in the middle, then add a small stack of plates and finish by filling in with smaller elements. If you look closely at the second and third examples, you see that I only switched out two things to change the look. What great ideas. Mine are never the same and it is not necessary out of choice but out of being forgetful. I cannot remember from one year to the next what I did. Guess old age is setting in. To take the artificial look off some of the pumpkins I have discovered Sea Glass spray paint. The one that appears to have a gray tone seems to work the best over the bright orange ones for me. Wow – that’s a great idea, Carol! I’ll have to give that a try. Thanks for the tip! Suzy, do you have a source for the plaid pumpkin above? So cute! Hi Margaret. The plaid pumpkin came from Target! All of your centerpieces look amazing. Thanks for the inspiration! Thank you, Melanie. Glad you found some inspiring ideas! In the first look with the amber bottles, is the candlelight just reflecting off of the bottles? I saw some bottles like that at JoAnn’s yesterday, but there is no way to put candles inside them. They look great in the picture, but I’m assuming the light is reflecting off of the bottles. Thanks! Wonderful ideas and suc beautiful centerpieces! I love them all!